English: The Flag of India. The colours are saffron, white and green. 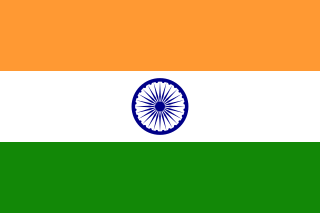 The navy blue wheel in the center of the flag has a diameter approximately the width of the white band and is called Ashoka's Dharma Chakra, with 24 spokes (after Ashoka, the Great). Each spoke depicts one hour of the day, portraying the prevalence of righteousness all 24 hours of it. 22:53, 19 अप्रैल 2010 1,350 × 900 (889 B) Zscout370 Finally got my hands on ISI 1:1968. The colors are in CIE 1931, so that will take a while to solve. However, this is what I got from the construction provided. Markup in Size 7 for the flag. 04:34, 3 अक्टूबर 2009 1,200 × 800 (1 KB) Zscout370 From downloadable files at http://india.gov.in/myindia/images/flag1.gif (Safron is still not legally defined when it comes to what it does look like, but the Government of India has flag images we can download and use).